David Pogue has written a piece in today’s New York Times comparing Microsoft’s new search engine with Google. The article’s title: Bing, the Imitator, Often Goes Google One Better descsribes Microsoft’s long standing strategy of imitating successful products after other company’s have established and developed newer technologies and markets. To find out whether Bing delivers better search results than Google, Pogue references a new website called Bing-vs-Google.com. 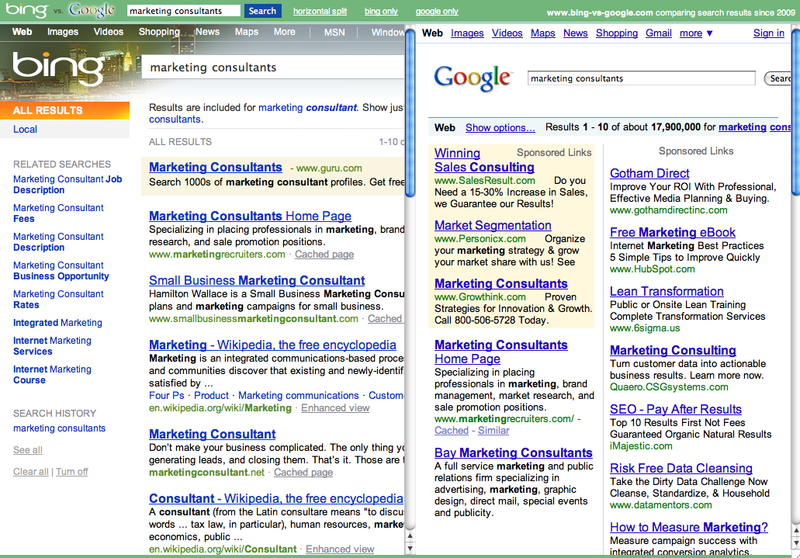 A search on Bing-vs-Google produces results pages that are hard to differentiate from one another. Microsoft’s strategy of imitating innovators may have produced market footholds in other categories. I will be surprised if imitating Google search results produces anything more than a few percentage points of search market share gain for Microsoft. This entry was posted on July 9, 2009 at 5:25 pm and is filed under Bing, But Its Not Google, Google. You can follow any responses to this entry through the RSS 2.0 feed. You can leave a response, or trackback from your own site.